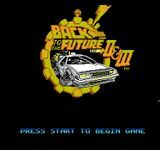 In Back to the Future Part II & III the player takes control of Marty McFly in the year 2015. He must find and put back several objects that Biff Tannen has hidden in an attempt to prevent anyone from getting their hands on the sports almanac that has made him a millionaire. After the almanac has been destroyed Marty must travel back to 1885 to save the Doc who has been trapped in the past. Again, items must be found and put back in their proper place in order to fix the timeline.